While the paint was drying on another Spitfire, I started this one as well. This looks a bit messy, but it is not unlike the actual N3071. I have read that the panel lines on the wing were filled with plaster of Paris and sanded smooth. 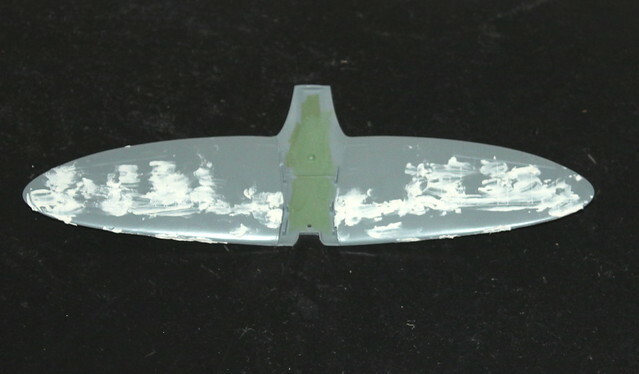 For both my Recce Spitfires, I have been sanding the wings and spraying light gray paint to check progress. I'll have to repeat the process a couple of times. I'll have to repeat the process a couple of times. Cheers, Stefan. Paint, sand, paint, sand, paint, sand, repeat numerous times. This seems to be the mantra for modelers. I hate the masking part.